This entry was posted in Art and tagged Gian Lorenzo Bernini. Bookmark the permalink. And all along I thought Bernini was a sewing machine! I know this is long, long after the posting here, but I just wanted to help you out with the story a little bit. Apollo, as the God of Archery, was none too pleased with Cupid’s bow-and-arrow accoutrement, so he insulted Cupid and indicated that he should leave the arrows to the big kids. Cupid had two arrows: one to inflict passionate desire for love, and one to inflict avoidance of love. At the right moment, he shot Apollo with the passion arrow, and the nymph Daphne with the opposite. Daphne’s father (a God) reluctantly permits her to remain a virgin, but Apollo hunts her down. Daphne’s pleas reach the ear of her father, and he turns her into a laurel tree to thwart Apollo. Apollo then makes the laurel wreath his preferred headgear. That story might still be a little lame, but it’s not as lame as you made it sound. Thanks, Jim — that’s as good a summary of the Apollo/Daphne story as I’ve seen. The statue does requires some context so that the viewer understands what he or she is seeing, otherwise you’re asking yourself, “why does that woman have leaves?” It’s an instance of a piece of art not quite speaking for itself, at least to modern audiences. In Bernini’s day, though, it probably didn’t need to come with an explanation. A Google search turned up almost 26 billion — with a B — versions of that image. 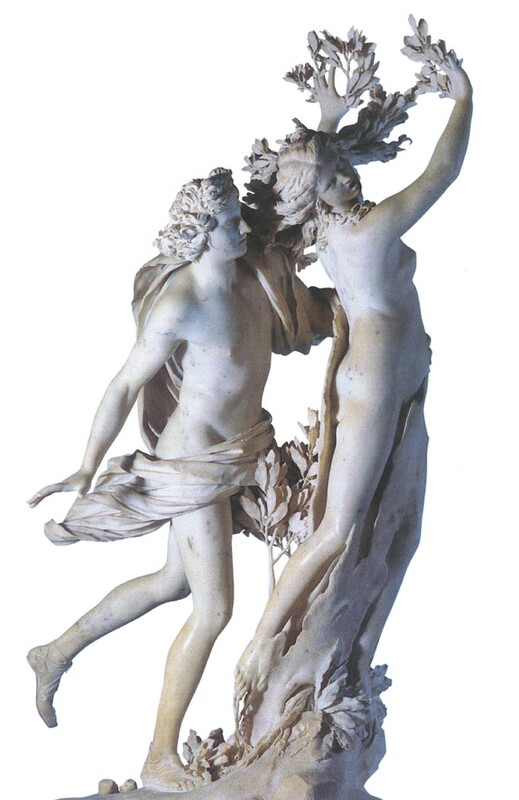 Since you intend to use it for commercial purposes, my suggestion would be to contact the Galleria Borghese in Rome, which houses Bernini’s magnificent sculpture, and which undoubtedly could provide you with a photo of it.